SPC Display Group has always had an “if you don’t see it, ask for it” approach toward serving customers. For many years this was directly associated to our catalog business, and the importance of letting customers know that if they wanted something they didn’t see in our catalog all they had to do was ask for it, and we would either find it, or make it. We haven’t been in the catalog business for many years now, but we absolutely still make the same promise – if you don’t see it, ask for it. And we don’t just mean standard and custom store fixtures and POP displays, shopping carts, hanger management systems, display hooks and sign holders; we mean anything to help you merchandise your products. 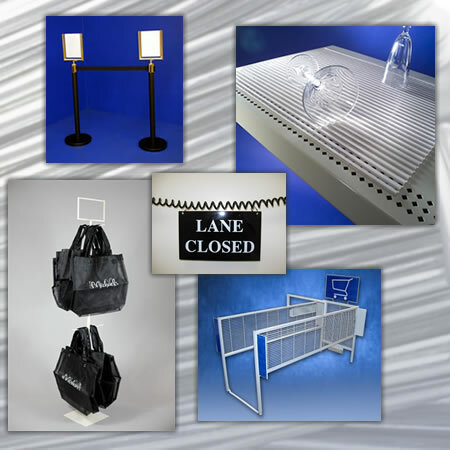 SPC has the expertise to either make, or source, hard to find and unique items, including mesh shopping bags and reusable shopping bag stands, anti-slip plastic shelf liners, metal and aluminum stand-offs for signage, plastic storage bins, shopping cart corrals and so much more. So remember, if you don’t see it (on our web site, or, for that matter, in anyone else’s catalog or web site), just ask for it. Let SPC use our experience and talents to find it, or make it, for you. Call us at 1.800.742.8585 or contact us on-line to learn more about our accessory sourcing service.